I decided to do Hamburger cake for my nephew as he loves hamburgers, I wanted to make this burger. Big and I only had a day to get it all done. I baked the vanilla cake, and while it was cooking, I thought better get started on the decorations. I coloured all my fondant and decided to make chips as well. 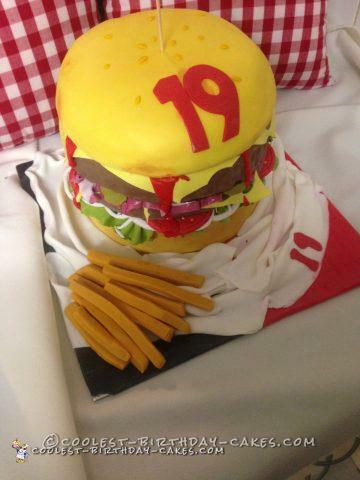 I must admit the fillings I used to decorate the cake and make it look like a burger, took longer than I thought. The tomatoes took the longest and I got a bit cross with that but, most of it turned out really good I did use buttercream as well. I had never made a cake hamburger before so I was please with the way it turned out and I used a bit of coco powder for the brown shadow bits on the bun.